1, Avenue Victoire (Prologement), ?Quartier Mososo ?Commune de Limete, ? ? The Association pour le Bien-étre Familial/Naissances Désirables (ABEF / ND; The Association for Family Welfare / Desirable Births) is a national NGO derived from the National Committee for Desirable Births (CNPPND) established by Presidential Order No. 73/089 of February 14, 1973. In 1978, the CNDD affiliated with the International Planned Parenthood Federation (IPPF), under the name of Zairian Association for Family Welfare / Desirable Births (AZBEF / ND) before becoming ABEF-ND in 1997. The ABEF mission is to ensure the welfare of family and community perspective of national development in the field of reproductive health. The program focuses on adolescents / youth, HIV / AIDS and other STIs, access to family planning and reproductive health, capacity building, and resource mobilization. ABEF works to promote quality services, increase awareness for couples on responsible parenthood, mobilize adolescents, educate on the fight against HIV /AIDS, provide comprehensive care for those affected and infected by HIV/AIDS and STIs, support women post-abortion, and advocate to decrease socio-cultural, legal, and religious barriers. Currently, ABEF operates two health centers in Kinshasa and Bas Congo and a maternity center in Kinshasa, offering a full range of traditional and modern contraceptive methods including the Standard Days Method® (Cyclebeads®), male and female condoms, IUD, implants, injectables, oral contraceptive pills, and emergency contraception. Vasectomy and tubal ligation are offered through the IPPF. ABEF also runs a community-based distribution project in the province of Kinshasa. (00243) 081 21 35 661? Umoja Maendeleo is a non-governmental organization based in Goma, North Kivu, DRC, that began in April 2010, whose mission is to provide health products, services, and information to the vulnerable population in eastern DRC in order to change health behaviors. The organization works to promote family planning and maternal and child health care and fight HIV/AIDS in this population. The organization works to promote the welfare of local communities and preserve their cohesion by fighting against obstacles to development. The organization engages communities to improve their socio-economic development through implementation of local development initiatives, promotion of peace and the fight against HIV / AIDS, poverty, and sexual violence. Umoja Maendeleo has a family planning project called Afia Yetu, committed to increasing community awareness about contraceptive methods, HIV/AIDS, and family planning, and gender based violence. The project began in July 2011 but has faltered recently due to lack of partnerships and donor funding. In 2011, the organization distributed 500 CycleBeads® received from IRH and two boxes of condoms in North Kivu. UMA has limited access to contraceptive methods due to a lack of funds, despite a high unmet need for contraceptives in North Kivu (31%). The Family Action Program (Le programme d’action familiale (PAF), was created by the Diocesan Medical Office of Bukavu (BDOM/Bukavu) in 1989, under the leadership of the Episcopal Conference of Kivu (CEPKI), held in 1985. The Family Action Program assists service providers in health facilities and communities in training, planning, implementation, supervision and monitoring of activities around natural family planning (NFP). Active in health structures and communities, PAF trains clinical and community service providers on family planning and awareness-raising and follow-up strategies for couples at the household level, in order to: increase the awareness of women and men about their role in family planning; reduce the total incidence of domestic violence; improve the quality of FP services offered to clients ; improve utilization of services through community mobilization; conduct follow-up with households; and reinforce collaboration between health structures and churches. PAF is active in the health zones of Kadutu, Katana, Idjwi, Ibanda, Miti-Murhesa, Nyangezi, Nyantende, Mwana, and Kabare, with an interest in extending activities to other health zones in South Kivu province. L’Action Familiale-FAAF (The Africa Family Life Federation) Conduite de la Fecondité ("Conduct of Fertility") was established in 1982 by Sister Marguerite Dobbels in service of the Catholic Diocese to control unwanted pregnancies in the DRC. The private sector not-for-profit faith based organization primarily promotes self-awareness methods of fertility control, as an alternative to other methods of birth spacing.In 1990, the organization expanded its program to support breastfeeding, primary health care, child health, nutrition, and hygiene and to fight against abortion, STD, and HIV/AIDS. The organization expanded even further in 2002 in collaboration with a gynecological practice to support women in the event of fertility concerns. The general objectives of Conduite de la Fecondité are to promote the utilization of natural methods of birth control, prevent unwanted pregnancies, protect the health of the mother and child, fight against STIs, and encourage couples to be responsible parents and play equal parts in the discussion of sexuality and family planning. In April 2004, Conduite de la Fecondité started working with the Institute of Reproductive Health and added the Standard Days Method® to the range of family planning methods available. Then in 2007, the organization introduced another method developed by the IRH, the TwoDay Method. The methods now supported and offered by Conduite de la Fecondité include the TwoDay Method, Standard Days Method® (CycleBeads®), and LAM. The Eglise du Christ au Congo, operational since 1971, is a pioneer in family planning, promoting modern contraceptives since the late 1970s. It is a private sector not-for-profit faith based organization. In the 1990s, the ECC/DOM project revitalized several family planning interventions in Kinshasa by offering contraceptives provided by the UNFPA. The PATS I, II ECC project also supplied five health zones by purchasing contraceptives from local suppliers and training providers. As the lead partner on the USAID funded SANRU rural health project through three phases from 1981 to 2006, ECC/IMA was the principle vehicle for delivering FP services in rural health zones. The last phase of the project, the SANRU (Santé Rurale) III project lasted from 2002 to 2006 in 22 health zones and focused on the capacity building of health providers in contraceptive technology, management, and supervision and safety of family planning facilities. The project partnered with Advance Africa, CFA Lomé, and the DELIVER Project to provide technical assistance in contraceptive technology, training to clinical providers on IUD insertion, family planning counseling, and surgical techniques for tubal ligation, FP/reproductive health education materials, and management and security of facilities. USAID established a distribution plan of products that were sent annually to health zones, allowing for monthly supply to health centers and including traditional and modern contraceptive methods. In 2004, the ECC initiated the PMURR (Programme Multisectoriel d'Urgence de Reconstruction et. Rehabilitation) intervention to provide family planning, including provider training and contraceptive supply, in 19 health zones in north Katanga and Kasai Occidental. IMA sponsored the Project AXxes, which ended in 2009, providing essential health care services and products, including natural and modern contraceptives (e.g. Standard Days Method® (CycleBeads®) and LAM, as well as oral contraceptive pills, IUDs, male condoms, tubal ligation, injectables, implants) to health clinics in 57 health zones based on a distribution plan. ECC continues to support family planning as part of primary health care services. GROUPE D’ACTIONS ET DE RECHERCHE POUR LA PAIX ET DÉVELOPPEMENT ; GRAPD EN SIGLE. Ville de Goma, Province du Nord – Kivu. Le GRAPD est une association sans but lucratif du droit congolais. Elle intervient dans le domaine de développement socio – économique dont les actions de réduction de la pauvreté, de la réconciliation communautaire, de la protection de l’environnement, de la promotion de la justice pour tous, du planning familial et de la santé pour tous sont son cheval de batail. Dans son volet socio – économique, elle a lancé en février 2013, un programme de lutte contre la pauvreté par l’octroi des micros – crédits rotatifs aux personnes vulnérables affectées par la guerre au Nord – Kivu ; programme intitulé : « Programme d’appui aux gagnes - peu dans la ville de Goma » A ce programme, il est associé une activité de sensibilisation sur l’éducation familiale et le planning familial. De nos jours, l’organisation compte plus de 300 ménages bénéficiaires de ces micros – crédits et de ses séances de sensibilisation sur le planning familial ; 20 groupes constitués en pères éducatifs dans différents quartiers de la ville de Goma. A la fin de l’exercice 2013, l’asbl GRAPD dans son volet de Santé pour tous, prévoit des formations des pères éducatifs sur les méthodes de planification familiale, la santé maternelle et infantile ainsi que la mutuelle de santé. Jusqu’ à ce jour, l’asbl GRAPD n’a pas encore de bailleur de fonds pour ses différents programmes ; ses actions actuelles sont financées par ses fonds propres issus des cotisations et dons de ses membres et des personnes de bonne volonté. C’est pourquoi, comme le préconise le Ministère national de Genre, Femme et Famille, l’asbl GRAPD souhaite travailler avec d’autres partenaires et bailleurs afin de bien réaliser sa mission. Toute fois, elle entretient des contacts avec d’autres organisations locales telles qu’UMOJA MAENDELEO et compte les élargir sur le plan national qu’internationale avec des organisations telles que : UNFPA, ASF, UNFEMME et autres ayant les mêmes objectifs que l’asbl GRAPD. Les objectifs du programme sur l’éducation familiale et le planning familial consistent à sensibiliser et à conscientiser les populations, sur la naissance désirable, la promotion de la planification familiale, la santé maternelle et infantile, et lutter contre les obstacles socio – culturels et religieux sur le planning familial ainsi que la mutuelle de santé. The General Referral Panzi Hospital is a local hospital founded in 1999 that is located in Bukavu and managed by CEPAC, a protestant church organization. The hospital offers specialized care in obstetrics, pediatrics, internal medicine, and general and specialized surgery. The hospital specializes in providing gynecological and holistic clinical care to victims of sexual violence, particularly fistula care. The hospital also has several projects supporting needs in South Kivu that focus on fistula, nutrition, HIV/AIDS, and providing care to survivors of sexual violence. The hospital conducts outreach activities in churches, schools, other hospitals, and NGOs. The hospital provides food to about 250 people per week at their Nutrition Center. The family planning project, called "Family Planning and Maternal and Infant Health," started in 2006 and is funded by PMU and Lakarmissioner. The project focuses on community outreach and service utilization through community mobilization and home visits. The areas served are Ibanda, Walungu, and Idjwi. TThe contraceptives offered by this program are the Norplant, the pill, IUD, Standard Days Method® (CycleBeads®), and Depo-Provera. The organization fights in the community for family planning. PISRF was created by mandate in 2004 in Lubumbashi, Katanga to work to reduce maternal and infant mortality by promoting family planning and reproductive health within the private health sector and through public-private partnerships. The organization works in the city of Lubumbashi and its boroughs including Kampemba (Cadastral and Hewa Bora districts), Katuba (Katuba 3 and Upemba Katuba districts), and Annex (Kisanga district). PISRF has established an international network through partnership with Omprakash, the White Ribbon Alliance for Safe Motherhood, and the International Organization for Motherbaby Childbirth through the DRC Motherbaby Network. In 1990, the organization expanded its program to support breastfeeding, primary health care, child health, nutrition, and hygiene and to fight against abortion, STD, and HIV/AIDS. PISRF provides behavior change communication on family planning and reproductive health through education sessions on reproductive health as part of their School of Marital and Family Relations project. PISRF also provides contraceptives to clinics, including CycleBeads®, LAM, OCP, implant, IUD, and injectable. These family planning services are integrated into the national strategy for reproductive and primary health care. 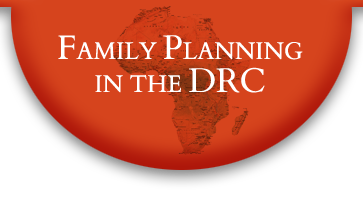 The organization also works to involve men in the family planning process, educate teens to adopt positive behavior change to prevent pregnancy, and conduct research on family planning in the DRC. PISRF is also involved in creating social media in family planning and works on biodiversity and the environment. SOFEPADI is a non-governmental organization that started in 2000 that works to promote women's rights and fight against sexual violence in the provinces of Ituri and North Kivu in the DRC. The MSF Switzerland project "Santé des femmes et de la famille" (Health of Women and the Family) has been implemented in a hospital in Bunia, called Karibuni Wamama, and is now running independently by SOFEPADI. MSF has provided training to SOFEPADI medical staff, supervised health services to ensure quality health care within the unit, provided training to administrative staff, and financially supported the provision of all drugs. The Karibuni Wamama health center now runs independently by the SOFEPADI team, although MSF continues to provide financial and technical support. SOFEPADI provides the Norplant (implant), condoms, Depo Provera (injectable), and emergency contraception. Along with contraceptives, SOFEPADI provides family planning education and counseling to women and couples at the consultation center KARIBUNI WAMAMA. The project provides education on the importance of naissances désirables (desirable births or wanted pregnancy), disadvantages of not practicing birth spacing, and various family planning methods, including risks and benefits. The project works to help beneficiaries make their desired method choice and safely utilize this method.